The Thomases Family Endowment of the Youngstown Area Jewish Federation Art Gallery is located in the main hall of Jewish Community Center of Youngstown. 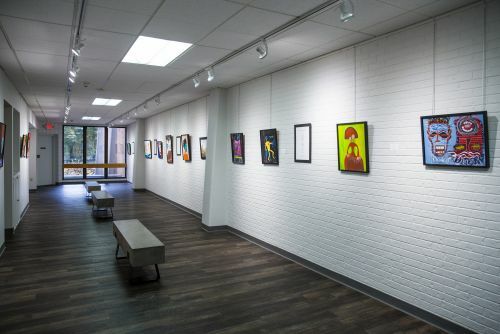 The gallery hosts six to seven exhibitions per year, primarily showcasing diverse artistic perspectives from local and regional artists and also showing the work of artists from across the United States. Exhibitions typically run for six weeks with an artist reception held to open the show. At least one exhibition every year focuses on a Jewish cultural connection. The Thomases Gallery Exhibitions Committee reviews proposals for exhibitions several times per year, and artists are encouraged to apply at any time. Submission of materials does not constitute automatic acceptance into programming. The curator and exhibitions committee reserve the right to selection of artists, and their artwork, based on quality and display requirements. Eligibility is open to artists 18 years or older. Interested artists should send an artist statement, resume or curriculum vitae, 4 or more images (JPG or PDF), and an image list indicating title, dimensions, medium, and date to hseno@jewishyoungstown.org. The Thomases Gallery is proud to exhibit Sandy’s Scrapbook traveling from Kent State University’s May 4 Visitors Center. When Sandy Scheuer, a Youngstown native, was killed on her way to class on May 4, 1970, she was a junior speech therapy major and honors student at Kent State University, and active in the local Jewish community. Nearly 50 years after Sandy Scheuer’s death, her life is the focus of the first of four unique exhibitions to be presented on each of the four students by Kent State University’s May 4 Visitors Center prior to the 50th anniversary of their deaths in 2020. The exhibit features ephemera from scrapbooks and other objects Sandy kept over the course of her life that were donated by her family many years ago to the Ohio History Connection. This unique exhibit from the National Museum for American Jewish History in Philadelphia will display The Movement to Free Soviet Jews. This is one of the most successful human rights movements in history and shows that voices raised in protest can lead to remarkable achievements.